Thanks Ali for the friendly welcome and honest guiding, please give my regards to Ayman and your wife Claudia for opening our eyes to lovely city of Luxor. As I said I wll stay, move to Luxor once I got retired from work. 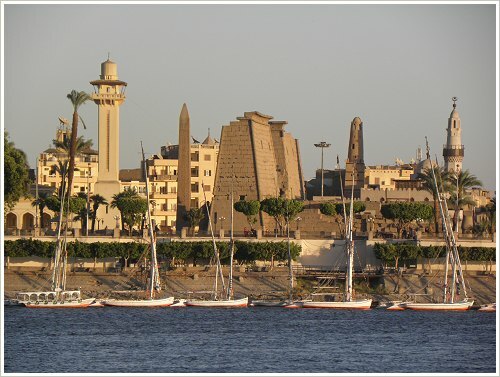 C U soon ISA in Luxor! we'd like to say a big thank you to both of you. It was a wonderful journey, and all worked very well! We had pre-planned along with you many things from Germany. Even so, our family was a travel group of 10 persons and our journey to Egypt should be fun even for our grandchildren, 10 and 12 years old. Due to email and skype it was really interactive. Your idea to provide us with an Egyptian mobile line was great. Already the visit of the Temple of Luxor where we went by caleches gave us a beautiful getting started on our first evening. The next day at Western Thebes by a minibus was a peak: you answered all our wishes. Ali knew every last at the Tombs of the Nobles. 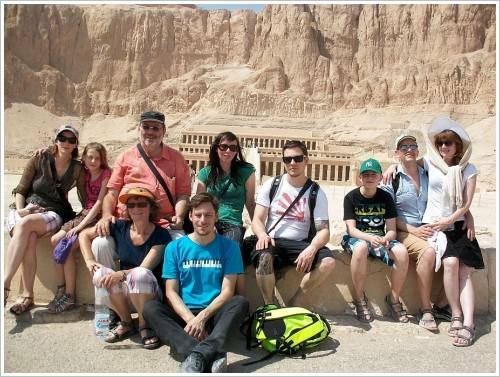 Thus we gained very special insights beside the usual program with the Valley of the Kings and the Temple of Hatshepsut. The lunch that you organised gave us the chance to meet you, too, Claudia. It was a wonderful rest on an exciting and hot day. The Karnak Temple, one day later with caleches again, was a dream. As our cruise ship landed in Aswan, it was wonderful to meet Ali and our good driver again and visit all sights there. Whether Abu Simbel or the felukas, there were no problems at all. The fact that Ali found even the tea house, of which we had just sent a picture by email, was amazing! We had seen much more than our fellow travellers on the cruise ship - and without the stress and the crowds they had. Thereby we paid less then them, it is really super. We will come back for sure and looking forward to it! We wish you all the very best in Luxor! Thank you so much and lots of love! Past a donkey, camel and horse renting our taxi stopped at an impressive big wrought-iron gate - Ali had picked us up at the airport. There, Claudia, our apartment agency, already waited for us. After a warm welcome she brought us to our holiday flat Hatshepsut 3 at the first floor. The flat delighted us completely: very clean and large, carefully decorated with hand-made oriental furniture - what more could one want. Claudia showed us the spacious roof garden likewise, and there we could see as promised the temple of Hatshepsut. Sheer enthusiasm - Egypt, here we are! Claudia and Ali also organised our trips to Dendera, Abydos, Esna und El-Kab. Claudia even accompanied us and made sure things run smoothly on our way through the post-revolutionary Egypt. As I had toothaches shortly before our departure, Ali came and took me to the pharnacy. A great all-round carefree service! I rented the apartment Hatshepsut 4 from Claudia, a smiling German lady married to Ali, a nice Egyptian man. We stayed for one week over Christmas and had a lovely time. I can highly recommend this place if you are after an authentic Egyptian holiday. The block of flat is situated on the West Bank, much quieter and less hassle than the other side. It has a rural village feel and it is within easy walking distance from the Nile and the amenities. Our flat was very pleasant, clean and if anything was missing in the kitchen, Claudia made the owner to buy it immediately! There is a terrace on the roof where you can relax and at night the view over the lit up Theban mountain is stunning! There are lots of small and nice restaurants around and you can shop in local shops for all the essential; there is even a supermarket by the ferry terminal. To cross over to the other Bank you walk to the ferry which crosses the river all day and late at night. It is a nice little “cruise” which costs 1 EP. The price is very reasonable compared to the touristy places. I became very friendly with Claudia and Ali!